Bangalore-based Remedinet Technologies Pvt Ltd, a company that provides pre-authorised e-payments platform to insurance companies & hospitals, has secured an undisclosed amount in funding from ace private investor Rakesh Jhunjhunwala's Rare Enterprises, with participation from existing investors Bessemer Venture Partners and Nirvana Venture Advisors. "The capital will be used for geographic expansion and product development," Munish Daga, director and CEO of Remedinet told Techcircle.in. The development was first reported by The Economic Times. Last year, Bessemer and Nirvana had acquired 100 per stake in Remedinet for an undisclosed sum. Remedinet (earlier HealthSprint Networks) was founded in 2006 by the trio of Brahmesh Jain, Rahul Shukla and P Rammohan. Jain is a serial entrepreneur and angel investor, who had previously founded companies including Commerzpoint Networks and MedVerve. Shukla is a B Tech in Electrical Engineering from IIT Kanpur and had previously worked at HP Labs India. Rammohan had earlier worked at Siemens, Philips and GE Medical Systems. Remedinet has developed a web-based platform to transact pre-authorisations and claims electronically between providers and payers. Its products include electronic preauthorisation manager (EPM), electronic claims manager (ECM) and electronic discharge manager (EDM), which enables providers and payers to use an electronic data interchange (EDI) technology to exchange information electronically to manage the entire cashless claims process. Additionally, it has developed Remediware, a suite of applications for payers that can be deployed by insurers, community health/micro-insurance service providers and government-run health schemes in India and abroad. 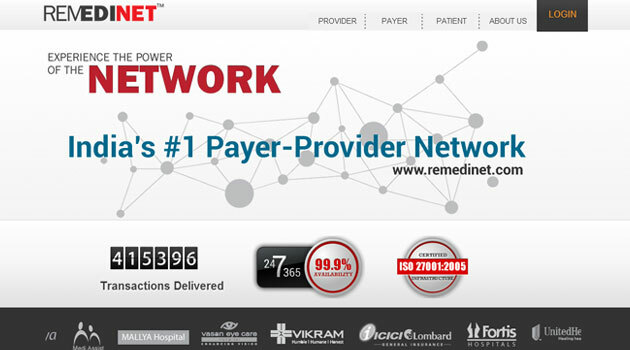 Remedinet claims that its payer-provider network, Remedinet.com, is servicing over 200 providers and eight payers. The company's clients include Fortis Healthcare, Vasan Eye Care, ICICI Lombard, Max Bupa and MediAssist.